Oct. 31st by With thy Needle & Thread - 40 ct. Legacy Linen by Picture this Plus using the called for threads. (1 over 2). 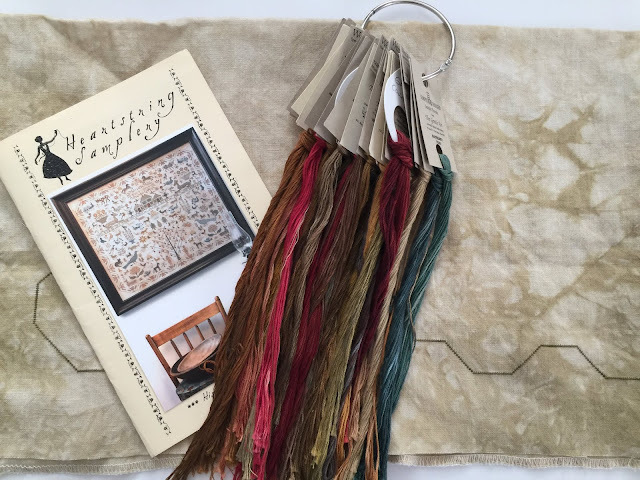 Sarah Redfearn by The Scarlett House - 40 ct. Vintage Examplar, Various hand-dyed silk threads (1 over 2). His Eye is on the Sparrow by Heartstring Samplery - 40 ct. Legacy by Picture this Plus using the called for hand-dyed cotton threads (1 over 2). Friend's of the Hart by Plum Street Samplers - 40 ct. Sand by Picture this Plus, hand-dyed cotton threads (1 over 2). Albuquerque Sunset by Casapinka - Madelintosh Tosh Merino Light - Astrid Gray and Hedgehog Fibres Sock - Pheasant. Suburban Wrap by Joji Locatelli - Madelinetosh Tosh Merino Light in El Greco, Antler and Sugar Plum. Powder and Dust Shawl by Veera Valimaki - Madelinetosh Twist Light in Birch Gray, Yarn Experiments Monkey Sock - Meet me in Charlotte. and Malabrigo Sock in Eggplant. 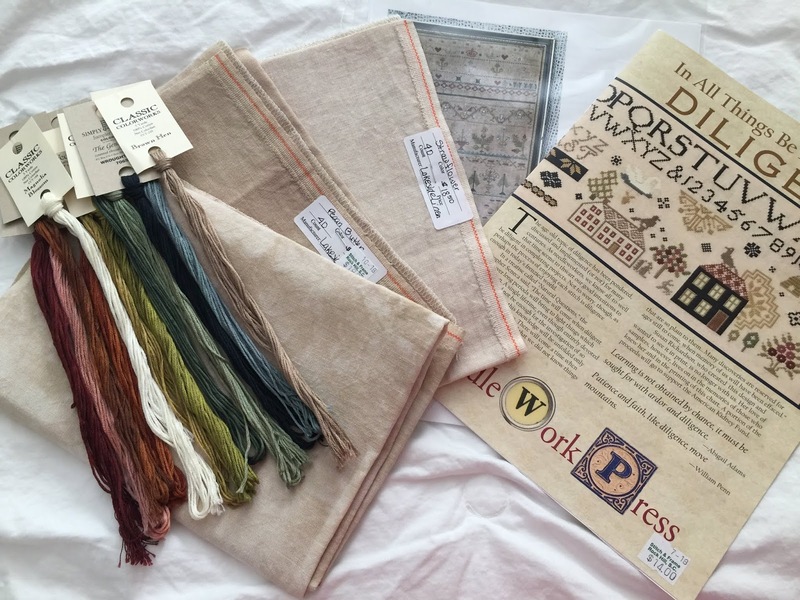 From The Stitch and Frame Shop - In All Things Be Exceedingly Dilligent by Needlework Press, 40 ct. Sand by Picture this Plus and 40 ct. Vintage Pecan Butter and Strawflower by Lakeside Linens. From Katrina Boyd - Ann Wright 1726 by Samplers Not Forgotten. From my dad - Love Abide by La-D-Da and Merry Be Your Christmas by Abby Rose Designs. Congratulations on your finish! Your WIPs are looking good and you are off to a good start on His Eye. What fabulous fabrics and charts you picked up! Love to see all of your Sampler stitching. The knitting is beautiful also. Thank you for sharing your stitching and knitting. I appreciate your sharing wit us about your struggles with colors and online ordering. I have to love a piece's colors to keep working on it. What kind of Legacy linen are you using? When I look online for PTP 40 ct. Legacy linen there are still all these kinds, Belfast, Cashel, Lugana... I really don't know what the differences are. Are the holes bigger in some of these? Why do you pick what you pik.